Born on January 31, 1942, Edward Parker Evans was a graduate of Yale University and Harvard Business School. Mr. Evans was Chairman and CEO of various companies including MacMillan Inc. A businessman, philanthropist and horseman, Mr. Evans' Spring Hill Farm in Casanova was the largest thoroughbred breeding farm in Virginia. Mr. Evans was honored by the Thoroughbred Owners and Breeders Association as the Virginia Breeder of the Year more than 10 times. He was the Breeder of notable horses St. Liam — winner of the 2005 Breeders Cup Classic, Quality Road — track record breaker, Nite Light, Gygistar, Tap Day, Misty Galore, Gold Mover, Minstrella and many others. The dispersal of Mr. Evans thoroughbreds in the years following his death resulted in record gross receipts of more than $62 million. You can read more here. Mr. Evans’ thoroughbred breeding prowess was so legendary that his legacy continues to make an impact on racing today. Quality Road, one of the most successful horses bred by Edward P. Evans, won eight of 12 starts, earned $2,232,830 during his racing career and holds 3 track records. Quality Road stands stud at Lane’s End Farm in Lexington, KY with a portion of his stud fees paid to the Edward P. Evans Foundation. 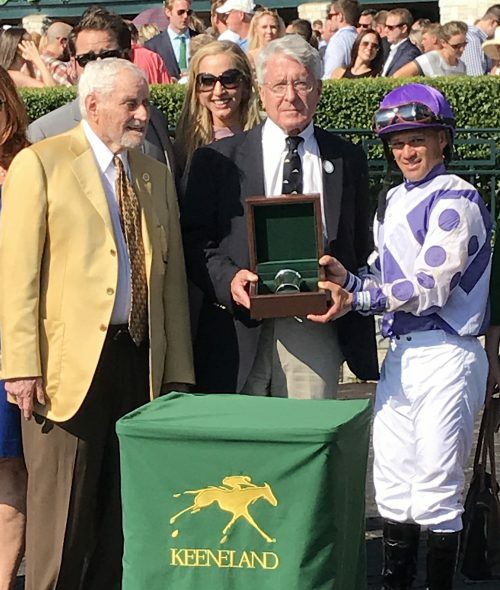 Shell Evans presents the Winners’ Cup to jockey Javier Castellano riding for Ashbrook Farm in Race 5 “Quality Road” on October 14, 2017, run prior to the Queen Elizabeth II Challenge Cup. EvansMDS, the primary medical funding initiative of the Edward P. Evans Foundation, is dedicated to finding cures for Myelodysplastic Syndromes (MDS)—a collection of rare but devastating types of blood cancer.